Sourya is a Legal Consultant, Edupreneur, and Independent Correspondent. He got bit by the entrepreneurship bug in his first year of law school, and founded Arguendo, which is a collaboration based, knowledge and information sharing platform to help people share information, news, stories, experiences, and ideas from all corners of the world to create a better, more informed society. Following that, he started Off Campus Class, which is a virtual finishing school, teaching “employbility” skills, to current students and graduates. He is also the founder of LearnLaw, an YouTube based channel which teaches legal concepts to lawyers and laymen alike, with the use of animations. His organization, The Arguendo Initiative is a Voting Member of Civicus, which is a global alliance of civil society organisations and activists dedicated to strengthening citizen action and civil society around the world. 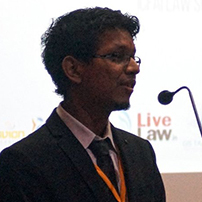 Sourya has also worked with numerous national and international NGOs, including The Red Elephant Foundation, Safecity (Red Dot Foundation), and That Mate etc, besides having experience working with multiple law firms and lawyers, both one transactional matters and litigation, in Bangalore and Hyderabad. Sourya also regularly contributes as a Guest Contributor to multiple online portals including LiveLaw, The Logical Indian, Qrius etc.